Toronado is, quite simply, one of the premier beer bars in the country. They have 40+ taps of serious brew and a fine bottle beer list. (Ask the bartender – the bottle list is held behind the bar.) There are usually several cask beers on hand pump. They take their beer seriously here and the bartenders know beer well, but are often too busy for more than taking your order. 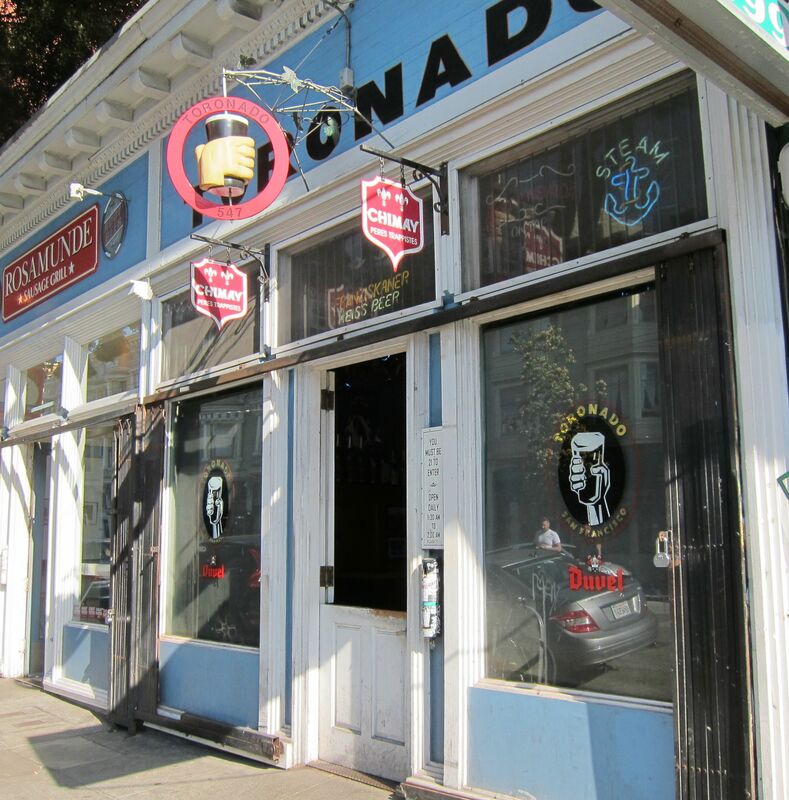 Toronado was one of the first craft beer bars in the country. Known for an international barleywine festival hosted every February for years, and inspiring the formation of SF Beer Week, Toronado is like no other bar. There’s a lower-Haight Street post-punk dive-bar grunge patina to Toronado that patrons love. Loud jukebox music usually accompanies the fast moving bartenders, making conversation daunting at time. You’ll have to let the beers speak. It’s over a mile from BART and uphill, so you may want to hop a bus to get to the corner of Haight and Filmore. From Civic Center BART, exit on the north side of Market Street. Take MUNI bus #6, or #71 which go up Haight Street. (Remember to ask for a transfer for your return trip). Get off at Fillmore Street. Walk across Haight Street. Toronado is on the south side of Haight 1/2 block west. From south of the City, if you prefer, get off at 16th St BART, exit on the east side of Mission Street. Take the 22 Fillmore bus from the northeast corner of 16th and Mission (remember to ask for a transfer for your return trip). Get off at Haight Street. Cross Fillmore and walk 1/2 block west. If you prefer to use the MUNI underground rather than a MUNI bus, you can walk about 5 blocks from the N Judah stop at Duboce and Fillmore, uphill on Fillmore to Haight Street. Official 16th St Station and connecting transit info. FYI: I prefer to get to Toronado by taking the N-Judah MUNI “light-rail”. that are on Market), climb one level up, and go into the Muni Light Rail Platform. about 5-10 minutes until the train emerges above ground. and get off at Duboce Park (before the train goes underground again). because its a level walk, more or less). Either way, its less than 1/4th mile of walking. Thanks John. That’s an easy way to travel, especially for those who are more comfortable staying in the underground station for the transfer. We have been of the opinion that suggesting the above-ground busses allows more observation of the town, gets you a few blocks closer, and costs the same… but you may have the more attractive option for many people. Good instructions. Toronado has some astonishing SF BEER WEEK events lined up for 2009. – Port Brewing/Lost Abbey Night with Tomme Arthur. – Rob Tod of Allagash does an Allagash night. – Ommegang Night – Ommegang Beers paired with a fine selection of cheeses. brewmaster Matt Brynildson… oh my. And an old favorite, the Barleywine Festival, with over 50 barlywines from around the country. Judging on Saturday, February 14th. The prize winners will go fast but good barleywines will be available for days.